It’s CJ again writing from Texas Tech University! Since I had so much food this morning, I had a smoothie for lunch, which was a nice meal substitute. Do smoothies go by different names in different countries? I never thought about that until today. 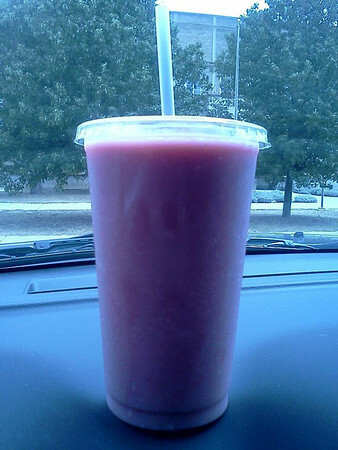 It was made with: orange sorbetto, apple juice, raspberries, strawberries, bananas, a yogurt base, and ice. They put all the ingredients in a blender until the ice is smooth, like slush. It was quite good, and since it was very hot here today (mid 90s Fahrenheit), it was wonderfully cool as well! I am so excited to see the progress on the kitchen in Malawi! I hope y’all remember to keep supporting Mary’s Meals over the summer! I have been cycling all day. It's fun going downhill but very hard going up. I even cycled down some steps. It was very bumpy and I have mud on my legs. I had a big breakfast as well. I had fruit with yoghurt and cereal. I was hungry at lunchtime and I don't think a smoothie would have helped me get back on my bike. Here's my lunch. It is a roll that we made at the picnic table. It's a Lancashire 'bottom of the oven' muffin and in it I had some pepper and onion soft cheese. 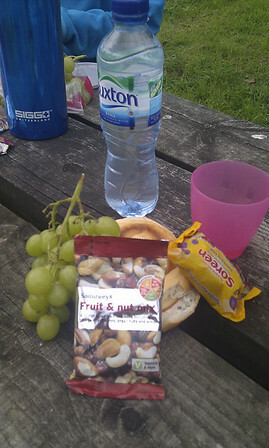 I also had a little cake and some fruit and nuts. The grapes were very nice and not crushed in Mum's rucksack. I was still thirsty after I had finished my water. Health Rating- 6/10 but I was cycling! I don't think a smoothie is a proper lunch. Please please please have a good lunch tomorrow. If you want to drink your lunch please have some soup. Tomorrow I am cycling to a castle where they filmed Harry Potter. I think the implied difference was that soup probably has vegetables in it. Vegetables are much lower in sugar than fruit is. Not to mention this smoothie has ice cream in it. Uhm, no it doesn't. Sorbetto isn't ice cream. Sorbetto also doesn't have to contain extra sweeteners. Other folks have argued more concisely than I have about the other points here, so I won't duplicate that effort. I am getting used to this lingo! A smoothie for lunch, perhaps you should have described your breakfast as well. But I don't mind, the smoothie was a good read. How many fluid ounces/milliliters was that smoothie? Cycling down steps, muddy legs and a bottom of the oven muffin, wait I see my favourite - is it, is it really MALT LOAF - awesome. Best get back to normality after that small outburst, great posts, keep em coming cowgirls!!! in Germany some people have such drinks for breakfast. But not with ice oder sorbet, but some cereals in it. We call it "shake". i'm with VEG on this. a smoothie isn't a meal. next time just add more bacon and we'll call it even. With those kinds of temperatures I guess I'd lose some of my appetite but I have to confess I'm not quite convinced about just a smoothie as lunch, perhaps because of the sugar content (if an American tells me something is sweet I worry! I very nearly spat it out when I had my first mouthful of peanut butter in Boston - that is not how peanut butter should taste if you're a Brit!). Maybe a simple salad first, perhaps with a pulse-based protein if you don't want something easier to digest (houmous or a chick pea salad, for example)? VEG's picnic looks to have plenty of energy for cycle fuel! I'm wondering if I can guess which castle you're visiting tomorrow - enjoy the treehouse if I'm right! I'm new to your blog. Has there ever been any pieces of hair? I think there was one, fairly early on. It was hiding under the cucumber. I love smoothies! My favorite are the green smoothies with kale and beets. Veg: Please show pictures of the castle! I LOVE Harry Potter!!! In yesterday's comments, Sophie Pither said, "Be interesting to see what rating an official from the Scottish or English Govt would say about it." As a native of the USA, I can't speak to what the Scottish or English goverment would say, but I can tell you about what the US government considers health eating. MyPlate is the current nutrition guide published by the United States Department of Agriculture, depicting a place setting with a plate and glass divided into five food groups. It is divided into sections of approximately 30 percent grains (preferably whole grains), 30 percent vegetables, 20 percent fruits and 20 percent protein, accompanied by a smaller circle representing dairy, such as a glass of low-fat/nonfat milk or a yogurt cup. Given that only 20% of each meal is supposed to consisist of fruits, the US government would not consider a fruit smoothy to be a "healty" meal. Pretty obviously, yesterday's "lunch" wouldn't fit either. Nope, a smoothie is a meal. I have one most mornings for breakfast. There's a significant difference between what you describe here and what CJ described. Yours includes both vegetables and fruit and the only sugar is what's in the fruit. CJ listed "orange sorbetto" first on her ingredients. A typical sorbet recipe that uses two oranges includes half a cup of sugar. OK, she probably didn't get that much in her smoothie but I wouldn't be surprised to find 1/8 of a cup or more in there plus the sugars from fruits with higher sugar content than your apple and orange. Quite possibly the yoghurt was sweetened too. A commercial sorbet may also have additives to extend its shelf life and soften its texture. I think it's looking like quite a different prospect than your Green Power! I don't think that a lunch of fruit and yogurt automatically constitutes an unhealthy meal; after all, that was part of what you had for lunch, VEG. And sweetness is not necessarily an enemy, we're born with a love of sweets for a reason. They quickly provide the energy our body needs to operate. So having some fruit for lunch can prevent an afternoon energy slump. It's only when we cater to our sweet tooth to excess that it becomes a burden on our body; and unfortunately commercial food products are too often needlessly sweetened to appeal to our cravings. So I only question the orange sorbetto, which quite possibly had some additional and unneeded sweetening put in it. That, and the possibly Texas-sized serving. But as long as the other meals of the day are nutrionally balanced, a frosty smoothie of fruit and yogurt seems like a nice appropriate lunch to get through a hot hot HOT Texas day. I think these guidelines that show percentages of different food groups on a plate are a useful guide, but don't need to be followed rigidly over every single meal. It's much more helpful to look at what you eat over a longer period of time, maybe a week and then work out what your average meal looks like. Also it doesn't matter whether you want to eatthe 'right' food for the 'right' meal you could have steak and salad for breakfast, a smoothie for lunch and porridge for dinner (though perhaps not all on the same day)and it wouldn't matter a bit, so long as overall you're eating everything you need and not too much else! Enjoy the cycling and the castles VEG! You are now viral for a very lovely cause. I would be honoured to be offered to be a guest on your blog. Sadly to have the cheek to call a smoothie lunch is very very sad. I felt robbed when I read the article! A salad on the go with a piece of fruit would have been better. That's my point of view of course. Let's hope tomorrow will be a bit more interesting. 30th July- Australian Primary School – No lunches provided in Australia so how do you make packed lunches appealing and interesting in a hot country? 6th August- Brazil – Big difference between public and private school dinner provision. Bloggers two primary aged boys. 13th August- Girl Scout Camp, USA. A week of open air cooking and camping from California, USA. Expect songs! 20th August- Finland- Primary school in Mikkeli. School meals provided free of charge in Finland. 10th September- Japan- Primary School in Tokyo sharing their culture of school lunches. 17th September- United Nations International School, New York. Children from around the world bringing in food from their home countries. 24th Sept- Switzerland- School in Geneva. Pupils supported by a Geography teacher in preparation for…. 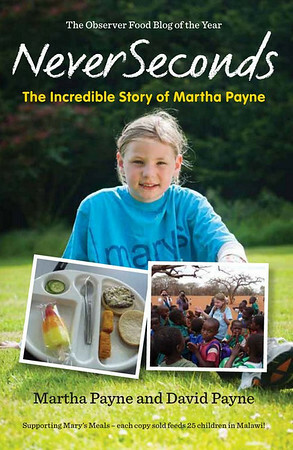 15th Oct- A different school each day from the projects Mary’s Meals supports from around the world. I think smoothie is named smoothie in Brazil too. Veg, I'll love to see the castle, I love Harry Potter. Be sure to share some photos of your awesome adventure VEG!